After you relax with the beauty of the karst landscapes surrounding you in Guilin and Yangshou and adjust to your surroundings, you will get to hike the Longshen terraces and explore the Dong minority with its flower bridges, drum towers and uniquely beautiful singing. As you visit Zhaoxing, known as the “land of festivals” and the cradle of ancient music, you can relax as you revel in the culture of this region. Continue on to the remote beauty and visit a local Miao family noted for making Lusheng (bamboo reed pipe) and enjoy a dinner made with Miao people's cuisine, sour soup fish in hotpot. Enjoy relaxation in one of the tea houses in Chengdu, which is known for its city parks and relaxed urban life, as well as being home to the world famouse pandas. You will also explore the “Yellowstone” of China when you visit JiuzhaiGou and take a peek at Huanglong, famous for its colorful lakes, snow-capped peaks, glaciers, mountain landscape, diverse forest ecosystems, waterfall and hot springs. You will see the world’s largest stone Buddha and will see the Mt. Ermei, which majestic cliffs, deep valleys, flying waterfalls, sea cloud and verdant forests, which is referred to as 'a beauty spot under heaven' by Chinese people. Though you begin this trip in the metropolis of Shanghai, e will visit two different worlds on this trip through China. While you will get to experience both modern Shanghai and old town Shanghai, you will also get to explore the beautiful mountaintop experience as you stay at a luxury hotel at the top of the amazing Huangshan Mountain, with its grand vistas and sunrise observation deck. 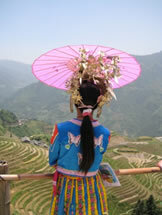 This tour also takes you to explore "China's most beautiful village" of Wuyuan and allows you time to explore the ancient water cities of Suzhou and Hangzhou, also called the “Venice of the East.” It’s a trip that will take you to many places that you will appreciate, and many others may not expect to see while visiting China. 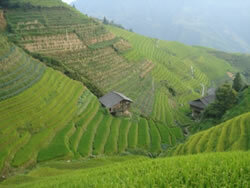 It’s an amazing trip with breath-taking vistas and visits to quaint cities and local residences. You can retrace some of the path, known as the “Silk Road” on this journey. You will also get to explore the rarely visited JiaYuGuan Fortress of the Great Wall, which is fortress was considered to be both the western tip of the Great Wall and the western boundary of the Chinese empire. We will take you further into exploration as you visit the Dunhuang Museum, which displays exquisite Buddhist art and manuscripts and historical connection to the passage of numerous monks who traveled the Silk Road. In this unique and arid countryside, you will get to visit the “Singing Sand Dunes” of Dunghuang before you stop and visit the Lake of Heaven in Urumqui. Yes, this is an “off path” trip for those interested in exploring cultural roots. After visiting the cultural hot spots of Beijing, and taking it all in, relax and enjoy a family "home-stay" in Wuhan, language lessons, and learn traditional Kung Fu as you get off the "beaten path" for a while. This "camp" style tour offers it all!! In a few weeks, you can visit major sites of China, do some "summer camp" activities and spend time living with a middle class Chinese family. This trip is one you may have dreamt about and it is not for the faint of heart as you travel to Tibet and to elevations of roughly 15,000 feet above sea level!! Enjoy key sites of multiple ethnic and minority groups. Visit Lijiang, Shangri-La, Tibet and take in the local flavor of these unspoiled areas in outermost regions of China. Visit the home of a local Tibetan family and enjoy a tea-drinking ceremony. 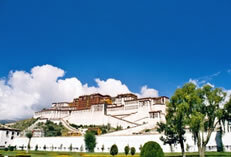 Visit the most recognizable Tibetan symbol—the Potala Palace. Have your best camera along – this is clearly a trip of a lifetime!